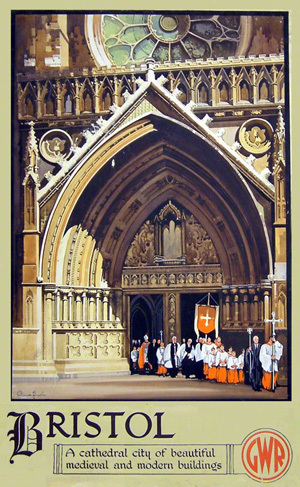 This pre-war water colour painting of the west front of Bristol cathedral by Claude Buckle manages to capture the superb architectural features of the cathedral entrance in this 1930’s railway poster. Pre war the artist was responsible for all the artwork including the writing in the poster. The original of this painting can be viewed at the National Railway Museum at York. (2014) Created in 1938. 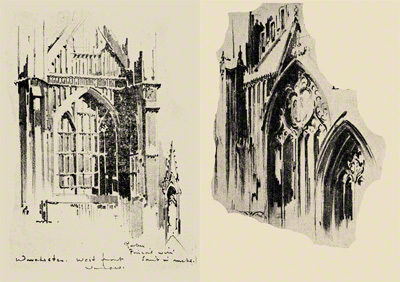 Claude Buckle made many pencil sketches of the Cathedrals he was going to paint. These sketches are examples of Winchester. Similar sketches would have been made of Bristol. Buckle did not as a rule complete any of pictures in situ, preferring instead to take the sketches back to the studio.